The rough draft of the new book has undergone its first editing sweep and is also now titled. Confidence Game will release in late August or early September. Again, this is a standalone story in the TCOTU galaxy, with the sequel to Hero of the Republic still in progress. I’m still searching for the perfect cover art for Confidence Game but the internals of the book are complete with just a multitude of editing passes to go. It’s been a real joy to watch this galaxy grow as the various books and series evolve. We’re finally seeing what’s “East” or Spinward of the Brevic Republic. 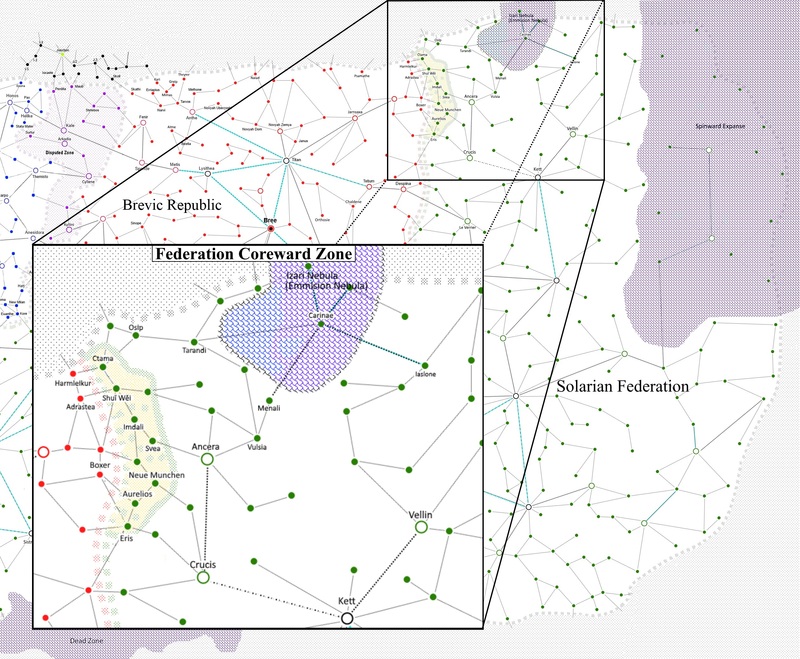 The Coreward Corporate Zone (CCZ) is the yellow portion of the map and helps designate four more of the thirteen major corporate-owned systems. (The final four are the Central Systems, where Nessus is located, which appeared in Last Measure of Devotion.) The two major corporations portrayed in Confidence Game are Appiation Unlimited Transactions (comprising the Svea and Imdali star systems) and Tengying Corporation (made up of the Shui Wei and Ctama star systems). Notable are also major features in this sector of space: The Izari Nebula and The Spinward Expanse. There has also been some “creep” coreward by the Federation and Republic as both governments have expanded upward on the map over the past 10 years (relative to where we are in the various storylines). The Solarian Federation has made greater gains, despite the unfortunate position of the Izari Nebula, but then, the Federation’s resources weren’t drained by the Brevic-Hollaran War. This entry was posted in The Universe, Updates and tagged Confidence Game, star systems, This Corner of the Universe. Bookmark the permalink.